The short-term interest rate set by the central bank is one of the most important numbers in any country’s economy. Interest rates dramatically affect economic growth, inflation, the housing market, equity valuations, bond valuations, and even gold prices. In addition, the interest rate yield curve is important for an economy. The yield curve is the difference between long-term interest rates and short-term interest rates, often quantified in the United States as the difference between 10-year Treasury interest rates and 2-year Treasury interest rates. It’s among the most reliable of recession indicators in the United States, but less clear internationally. This article takes a look at why interest rates and the yield curve are so important to be aware of for hands-on investors, and what they’re telling us now. A central bank can’t determine all interest rates, but they can determine the shortest-duration and most important interest rate: the overnight inter-bank lending rate. This rate trickles up to all other debt classes, strongly affecting them, but indirectly. So, as the Federal Reserve raises or lowers this key rate, it eventually affects treasury bonds, mortgages, corporate bonds, auto loans, margin debt, student debt, and even many foreign bonds. There are other factors that affect interest yields on various debt, but the Federal Funds Rate is one of the most important impacts. The Federal Reserve reduces this rate when it wants to produce “easy money” to stimulate the economy. A low interest rate for all types of debt encourages consumers and businesses to borrow money and use it to consume or expand, which benefits the economy in the short term. In contrast, the Federal Reserve increases this rate when it wants to tighten money to reduce or prevent price inflation, to deflate economic bubbles, or to improve the desirability of holding its currency compared to other currencies. It makes saving money in bank accounts more appealing, and borrowing money for consumption or business expansion less appealing. Generally speaking, the Fed reduces interest rates shortly before or during recessions, and then starts raising interest rates after the economic recovery when inflation starts to rise. You can see on the chart above, for example, that the federal funds rate is generally rising during white periods (non-recessions), and is reduced shortly before or during the grey periods which represent recessions. Interest rates affect stocks in a few ways. First of all, during easy money (low interest) periods, it encourages corporations to borrow a lot of money in the form of cheap bank loans or by issuing low-interest corporate bonds. 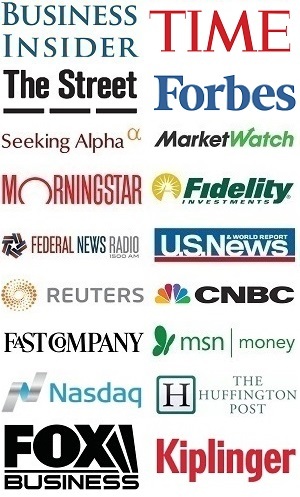 They use this money to expand, to pay higher dividends, to buy back shares, etc. It helps boost stock returns. Then, when interest rates rise, it means businesses can’t borrow as much because the bond yields are too high. Existing businesses that already have too much debt and start to see their fixed debt mature and get refinanced at higher rates may run into financial trouble as their interest costs to service their debt become too high. In addition, many lower-quality companies have variable rate debt, which automatically gets more expensive as interest rates rise. 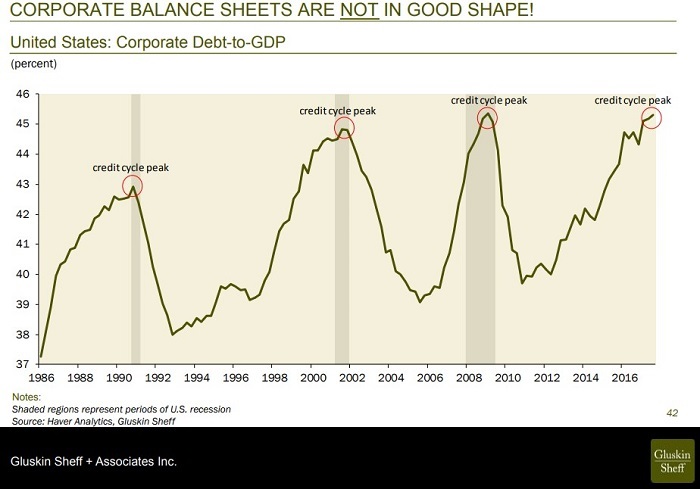 Low interest periods encourage businesses to leverage up in debt, but then when higher interest rates and a recession come, they end up de-leveraging. Secondly, when interest rates are very low, stock valuations tend to be higher because investors need investment returns from somewhere. When high-quality bonds are giving only 2-3% annual returns, thereby barely keeping up with inflation, investors are incentivized to go out and buy riskier assets like stocks. All this extra money in stocks pushes up stock valuations. Likewise, when interest rates rise, it starts to make high-quality bonds more attractive, with yields of 4-5% or higher, and well above the inflation rate. Investors have more incentive to take a bit of money out of stocks and invest in bonds, which means stock valuations tend to decline. Third, there is indirect correlation. Central banks tend to raise rates to combat inflation, and a strong economy is one of the causes of inflation that leads to central banks raising rates. Periods of rising rates are actually historically associated with good stock performance because both stock prices and interest rates tend to rise when the economy is strong, even though rising interest rates generally aren’t good for stock valuations. 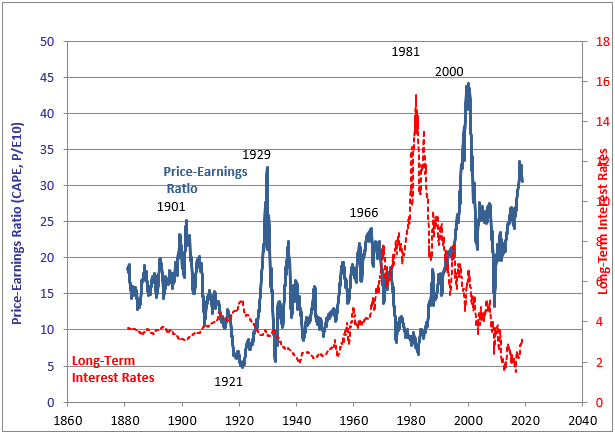 Basically, rising interest rates tend to negatively affect stock valuations, but generally happen during periods of strong economic growth when corporate earnings are high, which is generally when stocks are doing well. As a result, the early period of rising interest rates is often associated with strong stock returns even if stock valuations start to come down a bit. But as interest rates rise for a while and start to get perhaps too high, that’s when stock prices come down and the economy often turns recessionary. As interest rates rise, the prices of existing long-term bonds fall. For example, if there is an existing 10-year bond issued a year ago that currently offers a 3% interest yield, and today a new bond from the same company is issued with a 4% interest yield simply because rates are higher today, then the existing bond is totally inferior to the new bond and nobody would buy it on the secondary market. Therefore, the pricing of that existing bond will adjust downward so that it has the same yield-to-maturity as the new bond. The opposite happens when interest rates decline. The prices of existing long-term bonds go up. This is why bonds and stocks often have an inverse correlation. When a recession happens, stocks crash, and the central bank reduces interest rates to try to stimulate the economy. And when the central bank reduces interest rates, the prices of existing bonds typically go up, while stocks are doing badly. However, the central bank can’t influence bond interest rates directly. They can only influence the overnight lending rate, which massively indirectly impacts bond interest rates over time but doesn’t directly control them. For example, if the yield curve flattens, then bond interest rates might not increase even as the overnight lending rate does. When interest rates are low, mortgages are very accessible. For example, a prime mortgage rate at 4% for a $200,000 mortgage charges $667 per month in interest alone. When interest rates are higher, a prime mortgage rate at 6% for the same mortgage charges $1,000/month in interest. For a lot of people, that’s the difference between being able to afford the house or not. Higher interest rates make it harder to buy homes, which reduces housing demand, which generally reduces housing prices. The reduced housing prices entice home-building companies to build fewer homes, which reduces the demand for carpenters, electricians, plumbers, construction workers, home-supplies retailers, timber, mortgage banks, etc. Then when those people are out of a job, they buy less of everything else. Additionally, when home prices decrease, it negatively affects the wealth of the middle class that store the majority of their wealth in their home value. When consumers feel less wealthy, they are less likely to spend. The real estate sector therefore has a big impact on the broader economy. 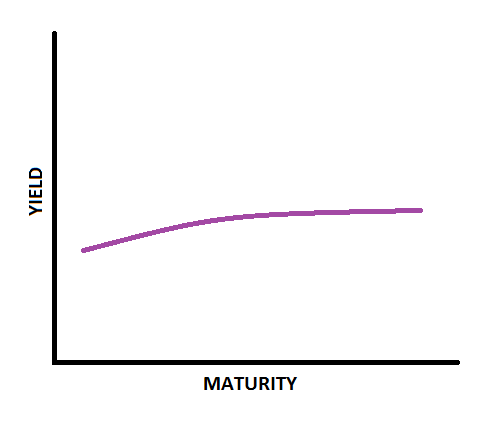 The yield curve is the chart of the interest rates of bonds of varying maturities. 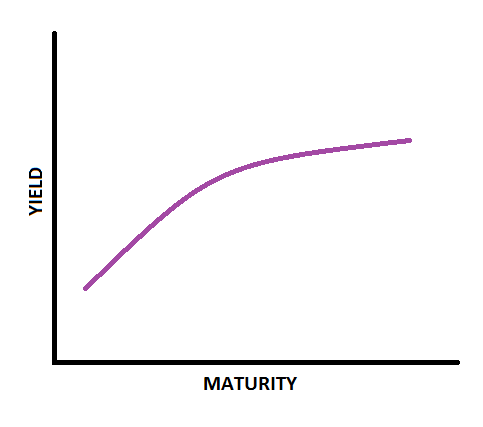 The vertical axis represents the interest yield on those bonds, while the horizontal axis represents the maturity (duration) of those bonds. There are two main factors that determine the interest rates of bonds. The first is how risky the bond is, meaning the likelihood that the borrower may default on its debts. The second is how long the bond duration is; how long until you, the lender, get your principal back. The more risky the institution issuing the bond is, and the longer until you get your money back, the higher the interest rate you’ll usually get on the bond to compensate you. For bonds of equal risk, like U.S. Treasuries (which are perceived as the lowest possible risk you can get from bonds), the duration is the most important thing. The longer duration a bond is for the same institution, the more vulnerable it is to inflation, changing interest rates, and even default. Therefore, investors normally demand higher interest rates to compensate them for locking up their money for a longer time. That’s why the yield curve exists; longer-duration bonds usually have higher yields than shorter-duration bonds from the same institution. The difference between short-term and long-term interest rates is a measure of how steep or flat the yield curve is. A steep yield curve means there’s a big difference in interest yields between long-duration and short-duration bonds. 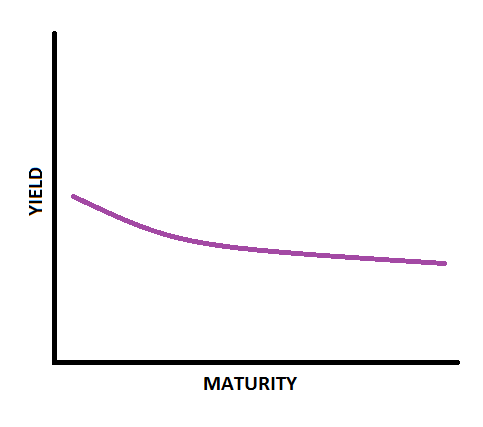 If you were to chart it as a yield curve, it is visually steep like the yield curve chart above. In the United States, the yield curve is most commonly applied to U.S. Treasuries. They’re among the most widespread bonds, and their yields have an impact on corporate bonds and international bonds. Towards the left of the yield curve you’ll have the shortest-duration bonds like 1-month, 3-month, and 1-year Treasuries. Towards the right of the yield curve you’ll have 10-year, 20-year, and 30-year Treasuries. Although longer-duration bonds generally have higher interest yields than shorter-duration bonds, there are rare times when the opposite is true, and shorter-duration bonds are the ones with higher interest yields. This is known as an inverted yield curve, or a yield curve inversion, and it’s usually bad news. An inverted yield curve is most-commonly measured in the United States by the difference between 10-year and 2-year Treasury bonds. Normally the 10-year bond has a higher yield. But when the 2-year yield is higher, it means there’s been a yield curve inversion. Every U.S. recession (shaded in gray) in the past 50 years has been preceded by an inverted yield curve in U.S. Treasuries. However, this relationship does not exist so strongly in other countries. In Australia, which is a major commodity exporter to emerging Asia, has managed to go very long periods without recessions in modern decades. The strong, continuous demand from China and the rest of emerging Asia helps Australia economically. Since the late 1980’s, the yield curve in Australia has inverted four times, but only one of those times resulted in a recession. The others merely resulted in mild economic slowdowns. Basically, external demand has been enough to prop up Australia’s economy even when the yield curve inverts. In Japan, which has a very slow-growing economy and rock-bottom interest rates for decades, hasn’t had a yield curve inversion since 1991, and yet it has had several recessions since then. Its yield curve tends to flatten a bit before recessions, but no longer inverts. Basically, interest rates are so low, and the economy is so slow-growing and deflationary, that the yield curve no longer has much meaning in Japan. Countries can have recessions without yield curve inversions, and can have yield curve inversions without recessions. Usually, at the very least, an inverted yield curve is associated with an economic slowdown (if not an outright recession), and a recession is at least associated with a flattening of the yield curve (if not an outright yield curve inversion). 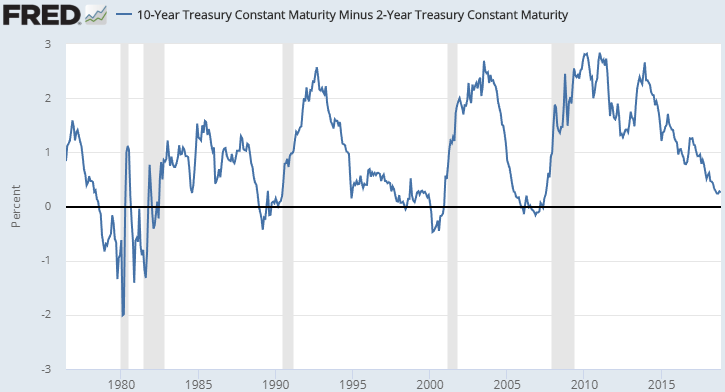 Although the United States has had a very consistent track record of the yield curve inverting before recessions in the past 50 years (neither has occurred without the other), data going back further than that shows that it hasn’t always been the case. And as the above examples show, other countries don’t have perfect relationships either. The yield curve is worth watching for hands-on investors, but not some axiom that we can place too much faith on. It’s an important recession indicator, but only one out of many. Why Does Yield Curve Inversion Occur? Although usually it is considered riskier to hold longer-duration bonds, there are cases where that might not be true. 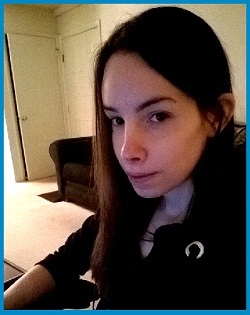 For example, if rates are moderately high now, and a lender believes that a recession is coming soon, and therefore believes that the central bank (Federal Reserve) will likely reduce interest rates to help stimulate the economy, then it makes sense for the lender to “lock in” current higher interest rates right now by putting a lot of capital into longer-duration bonds instead of shorter-duration bonds. This is because within a couple years the shorter-duration bonds will expire and the lender will have to re-invest into bonds at that time, likely at lower rates. However, if the lender locks in longer (10+ year) bonds at current rates while they are higher, they won’t have to refinance at lower rates during the lower-rate environment of a recession and its aftermath. In addition, due to the way bonds are priced, longer-duration bonds tend to go up in price when interest rates go down. Opportunistic bond investors, believing that an economic slowdown is coming and that the Fed will reduce rates, may buy more longer-duration bonds to profit from that reduction in interest rates. This increased demand for longer-duration bonds when lenders perceive that the Fed might cut interest rates in the short-term can drive the yields of longer-duration bonds lower, inverting the yield curve. Why Does an Inverted Yield Curve Slow the Economy? This difference between their borrowing at lower-yielding short-term rates and lending at higher-yielding long-term rates is their main profit, along with the various fees they charge. When a yield curve inversion occurs, banks will make little or no money from borrowing at short-term rates and lending at long-term rates. So, they stop lending, or at least reduce many of their lending activities. This results in a credit crunch. Businesses and consumers can’t get much access to credit, which hurts economic growth. Interest rates play such an important role in our lives. They determine how affordable mortgages are, whether our savings accounts beat inflation or not, whether certain bond funds will gain or lose money, and how much debt corporations and consumers can afford to borrow to expand and consume. It can even affect things like the price of gold. Likewise, the yield curve is a gauge of investor sentiment about upcoming interest rate cuts, and affects whether banks can lend profitably. An inverted yield curve is therefore both a predictor of an economic slowdown and then helps cause one once it happens, aka a self-fulfilling prophecy. Passive investors that maintain a diversified portfolio don’t have to concern themselves with interest rates and the yield curve too much. We can’t know for sure what’s going to happen, what’s going to be different the next time, etc. Just keep saving diligently and adding money to your portfolio. However, for active investors, or people that want to optimize major investment decisions in their life (like buying a house), it helps to know how interest rates compare to their historical levels, where we are in the business cycle, and what the yield curve is doing at any given time. Right now, U.S. interest rates are low but rising, which is associated with being later in the business cycle. In addition, the yield curve is much flatter than it was a couple years ago. Generally speaking, these are signs that an investor would do well to position themselves somewhat conservatively.